As we begin covering family travel here at Upgraded Points, we’d like to start with a few basic tips to make things easier when you travel with kids. Traveling with your whole family for the first time can be overwhelming. Even though it gets easier the more you do it, you’re going to run into a few challenges any time you travel with kids. 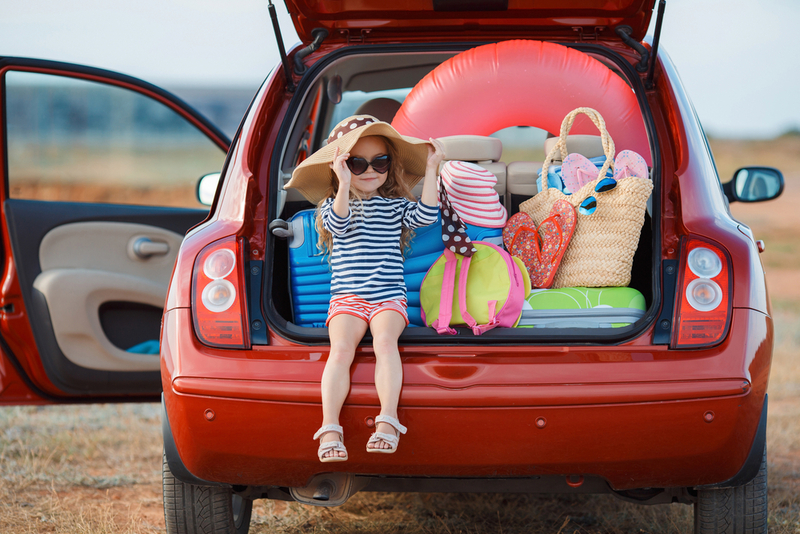 Being prepared and knowing what you’re getting into are two of biggest things you can do to make family travel go smoothly, but there are lots of little things you can do to make your trip better too. Lists like this can be overwhelming but packed with great information. Don’t worry, you don’t need to read this one all at once: there’s a handy table of contents you can come back to reference any time. You never know where there will be a little tidbit of information that saves you some time, money, or stress on your next trip. I’ve picked up lots of information over the years this way and I’m happy to share some of it with you now. Without further ado, here are the tips we think are the most useful and easiest to implement when traveling with kids. 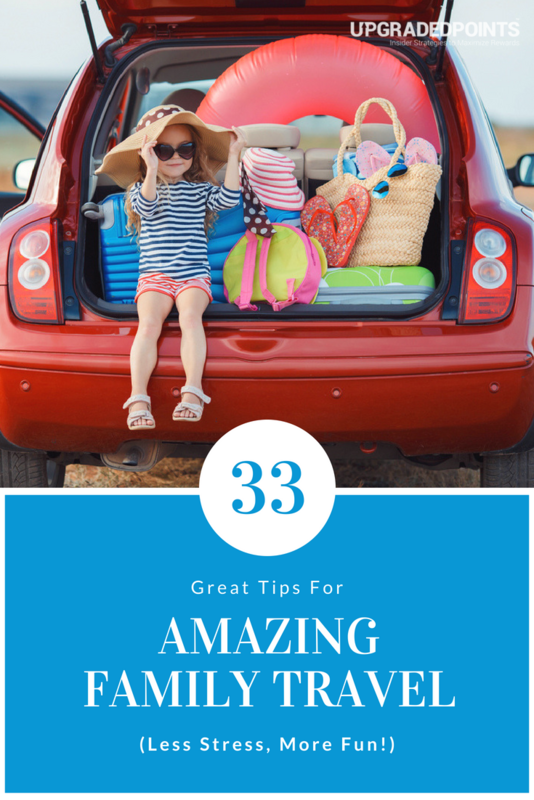 Traveling with your family can be awesome, but it can also be quite a challenge. But the more you travel, the easier it gets, so get out there with your kids and start now! Image courtesy of shutterstock.com. Planning for extra time is exactly the opposite of what I do when I’m traveling alone. I typically leave so little time at my home airport that once I get through security and walk to my gate, I can usually get on the plane within 2 or 3 minutes. This is definitely not what you want to do if you are traveling with kids. Be sure to get to the airport early and leave plenty of time for things to go wrong. You definitely don’t want to miss your flight because it took an extra 10 minutes to get your stroller and bottles through security. Then you are stuck at the airport waiting to be rescheduled with unhappy children. Trust me, that’s not fun! Flying is just one example of taking it slow, though. Leaving extra time applies to all parts of your trip. When you have the kids along for the trip, you may not be able to squeeze 4 museums, 3 restaurants, a walking tour, and a bike ride all in the same day. Bottom Line: Keep your schedule loose and leave plenty of room for adjustment. A flexible schedule will create less stress for you and your family and lead to a happier trip overall. Families have a tendency to pack everything kids use at home. Bringing familiar items will keep your routines consistent and you’ll be sure to have everything you need. Unfortunately, this is a terrible idea. At the end of a long travel day, there is a good chance you will end up carrying at least 1 kids, so you certainly don’t want to be carrying 100 pounds of luggage, too. Instead, pack as little as possible. The act of traveling itself will mess with your home routines, so trying to preserve all of them isn’t going to work anyway. It will just lead to frustration and sore arms. The great part about traveling is everywhere you go, children live there. If you find you’re missing something you need, you can always buy it at your destination. You do need to be a bit careful with this rule when visiting less-developed countries, but most places you would take your kids will probably have the essentials you need to care for them. Bottom Line: The less you bring, the easier it is to pack, the less you have to carry, and the more room you have for souvenirs. Of course, you have your flights booked for your trip, but your pre-booking shouldn’t end there. You might be used to showing up at a destination, getting a feel for the town, and picking a place to stay. This doesn’t work with kids. When you arrive in a new place, you’ll want to go straight to your lodging, drop off bags, and give kids a chance to rest if necessary. This is especially true if it’s been a long journey to get to your destination. You should know where you’re staying before you arrive. If you want a bit of flexibility in location, book the first night or 2 ahead of time, and decide where to stay for the rest of the trip once you’re settled. Pre-booking doesn’t end with flights and lodging, either. Anything you can book ahead of time is 1 less thing you have to worry about while trying to keep your whole family fed, amused, and happy on your trip. 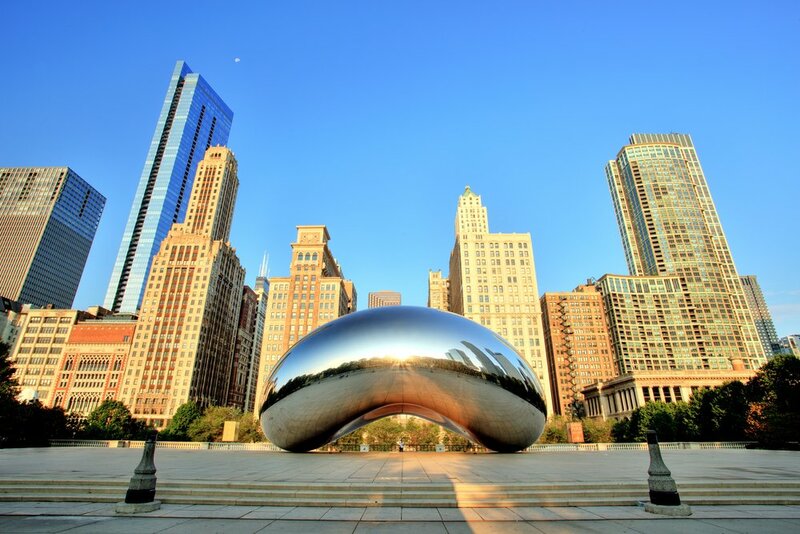 Hot Tip: In addition to lodging and flights, items you can book ahead of time include private and public transportation, sightseeing tours, private guides, and tickets for museums, theme parks, and other attractions. Book as many as you’re sure you will need ahead of time and you will have more time to relax and enjoy your destination when you get there. Introducing kids to the trip ahead of time is especially important for first-time travelers. When kids are uncomfortable, they aren’t happy. If there are too many new things going on, kids tend to get uncomfortable. Going over an outline of the trip and what will be happening can help kids understand their situation at each point in the trip. They will know what to expect next, and as a result, will be more comfortable with what’s going on around them. Explaining the trip can include telling them what they can expect at the airport, on the plane, and once they arrive at your destination. Take this opportunity to go over your expectations for their behavior throughout the trip. Detail how they should act on planes, in hotels, and on tours. Bottom Line: Once your children understand what’s going on, they are less likely to ask questions while you’re trying to take care of travel logistics. They will be happier, more comfortable, and excited about what’s coming next. 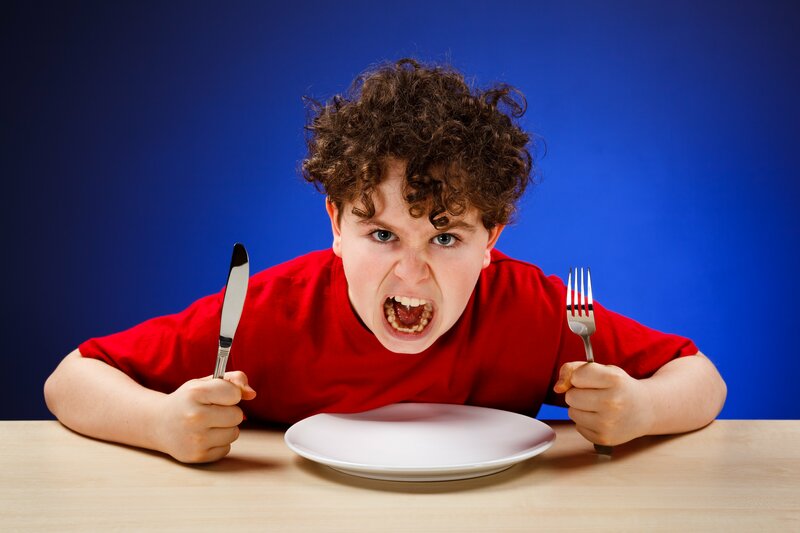 Hangry kids can take a fun family trip to miserable in a matter of minutes. I can’t emphasize this enough. Hunger can mean the difference between a happy family and cranky, hungry kids. Always have snacks available for your kids! You never know when the time between meals will get extended. It could be a delayed flight, unexpected traffic getting to your hotel, or a tour that takes a bit longer than you thought it would. The food at your destination may be quite different than what your kids usually eat. They may happily order lunch and then eat 2 bites of it because it wasn’t what they were expecting. An hour or two later on your afternoon museum visit, you’ll have a hungry kid to deal with. It doesn’t hurt to have snacks for you and other adults traveling with you as well. Adults can get just as hangry as kids can. Bottom Line: Having a few small and easily transportable snacks with you at all times can keep everyone happy until you can refuel. Investing in good gear doesn’t mean you need to have Tumi bags for your whole family. Our family travels with eBags Weekender backpacks and they’ve held up for years. You don’t need to have the best and most expensive version of everything. Buying quality gear means if it’s a little bit more for the stroller that folds up smaller, weighs half as much, and will still carry your child all over the city, you should probably spend the extra money. The same goes for a travel car seat. You want it to be safe, but if you can spend a few dollars extra for a seat that weighs 2 pounds instead of 5, you should. Look at the items you’ll be purchasing for your trip and figure out which features will make your life easier while you’re traveling. Also, take into account how many times you’ll be using that item. If it will make things easier and you’ll use it a lot, it’s worth a greater investment. You’ll be thankful for quality gear when you aren’t fighting to get a super-heavy bag in and out of a taxi at the end of a long day. Asking for child discounts can really save you a lot of money every time you travel. Some people have a tough time asking for discounts, but I promise, once you’ve done it a couple of times, it will be much easier. You’ll be shocked when you see how many places will give you a child discount when you’re traveling. Sometimes you can find child pricing on the website of the company you’re dealing with, but just as often, there is no mention of a discount. Even when there’s nothing written, be sure to ask. A quick email ahead of time or a simple question when you’re buying tickets can save you as much as half of the cost when traveling. Bottom Line: You never know unless you ask. We’ve found that businesses are often willing to give us a discount for our kids. If we hadn’t raised the question, we never would have known. It pains me to think of how much extra I’ve spent on trips when I didn’t think to ask for discounts for the kids. We touched on this when we discussed leaving plenty of time for the unexpected when traveling with kids. This point can’t be overstated, so we’ll address it again. When you travel with kids, THINGS. WILL. GO. WRONG. Maybe your little one has to go to the bathroom and you end up missing a bus. Maybe your son will leave his iPhone in a taxi in Barcelona with no way to get it back. Maybe you plan a great restaurant for kids at your destination, only to arrive and find it closed for renovations. There’s really nothing you can do to avoid these situations. The sooner you accept the inevitable, the less stress you will feel when it happens. Bottom Line: Remember, travel is an adventure. Even if it has a few speed bumps, the experience you’re giving your kids is irreplaceable. Our son really did leave his iPhone in a Barcelona taxi. It was the first day of a 13-day trip in Spain. We were getting to our first hotel, and our son didn’t notice until well after the taxi had pulled away. This led to a bit of misery and complaining from him throughout the rest of the trip, but since we didn’t even know what taxi company we’d used, we had to accept the loss and move on. It was a true test of parenting. Hot Tip: We’ve created a fun infographic of 30+ ways to stay safe while traveling. You’re bound to pick up a tip or two from it! Keeping track of your child seems like it should be obvious, but it’s important enough to mention. No matter what you’re doing, whether things are going smoothly or you’re having a logistical nightmare, always make sure you know where your children are. You’d be surprised how easy it is to get wrapped up in something like buying train tickets in another language. The next thing you know, your son or daughter has wandered over to the little shop at the train station to check out candy bars. If those candy bars are on the far side of a shelf and you can’t see your child, this could lead to a moment of panic. If you’re traveling with another parent or adult, share duties. One person buys the tickets and the other watches the kids. If you’re traveling alone with the kids, be sure that they stay in view at all times. If necessary, hold their hands or have them sit in your line of sight. Even the most vigilant parent can lose track of children. If your children are prone to wandering off, consider using a small GPS tracker that you can attach to their shoes or belt. The tracker will alert you if our child gets too far away and will let you track them to see exactly where they went. If a child gets lost despite your best efforts, you’ll want them to have your contact information. Your contact information should include the following items for all of the adults on your trip so you have multiple opportunities for help locating your child. For young children, the best way to share contact information is with a note in one of their pockets. If they don’t have pockets, tie a little card to their belt loop or stick it in their shoe. Don’t be afraid to get creative, but in any case, make sure your child knows where to find it. Help older kids memorize your phone number and email address. If they need the local address where you are staying, write it down for them or have them put the information on their phones. We all know a teenager isn’t going to go very far without his or her phone. One of the easiest ways to ruin a day of travel or possibly an entire trip is to have a sick family member. It can be even worse if the whole family gets sick. 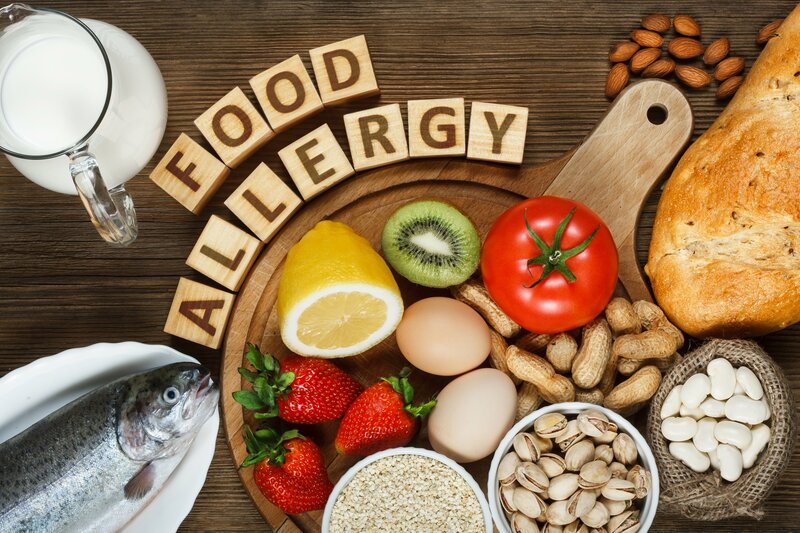 Whether your child has an upset stomach from the bumpy bus ride to your destination, or you find a new kind of tree pollen you’re allergic to, you want to be prepared to make the sick family member feel better as quickly as possible. If anyone in your family is taking prescription medication, be sure to bring it along. Whenever possible, take your medications in their original packaging, especially prescription medications. If you can’t take the original package, take a copy of the prescription from your doctor so you can show exactly what your prescription is and why you have it for border crossings and if your luggage is searched. Before your trip, check regulations for your destination and confirm you’re allowed to enter the country your medications without filling out additional paperwork or getting special permission. If anyone in your family has special needs, be prepared to talk about them while you’re traveling. Things you should be able to explain include allergies, special diets (vegan, vegetarian, soy-free, gluten-free, etc. ), and special physical or mental needs. Special needs might be straightforward for you to talk about and explain at home, but can be tricky if you’re traveling to another country and don’t speak the local language. Aside from learning the local language, the best thing you can do is use an online translation service to print out explanations of your family’s needs in your destination’s local language. You can make cards in both English and the local language. With cards, it will be easy for you to hand the cards to hotel staff, your waiter at a restaurant, or anyone else who needs to understand your special situation. With clear explanations, you can ensure your family gets the treatment you need and no one has to experience the discomfort of trying to explain a problem with hand motions or funny faces. Hot Tip: If you are traveling to several countries with different languages, you may need a few sets of cards. Make a set for each language. Just don’t hand out the wrong cards in the wrong country. A card with 2 different languages a person doesn’t speak isn’t going to help much. When traveling with kids, always check the countries you are traveling to so you know if there are any additional paperwork items you need to cross borders with children. Often, but not always, passports are all you need to travel with kids. However, some countries require you to carry the each child’s original birth certificate to prove that you are the child’s parents and have the right to leave or enter the country with them. You don’t want to get caught without the documents you need to get your kids home from vacation. Having the proper paperwork is especially crucial if you’re traveling without your child’s other parent or if you’re traveling with children who are not your own. In either of these cases, some countries may require that you have documentation to prove you have permission to travel with the child. Often, the documents will need to be notarized and available in both English and the language of your destination. There’s a good chance you’ll never need to show the documentation mentioned above, even if it’s listed as required. I’ve traveled solo with my kids to countries that required specific parent permission forms from the other parent and never needed a copy of the form. Bottom Line: It’s always best to be prepared. If you have any issues during your trip and need an identification form, you certainly want to have it ready to hand over. At home, you’d never think of taking your young child out for a drive without a car seat. When you travel, the rules don’t change. It’s no safer for your child to ride in a car without a car seat when you’re away from home than it is when you’re at home. If you plan to rent or hire a car at your destination and don’t know that you can get a car seat there, take a car seat with you. Most car rental companies have car seats available with your rental, but you should confirm before your trip that there will be a car seat there and available for your use. Some car services have car seats as well, but they are generally less common than car rental companies with car seats. A travel car seat isn’t always the one you have in your car on a daily basis. You want to get a car seat that’s light and easy to transport. It’s best if it can be used on the airplane, too. There are specific car seats made for travel. We hope to review some of them as we build out our family travel section. Our son picked up this journal at one of the craft market stalls at Pisac in the Sacred Valley of Peru on our trip last year. A travel journal as a souvenir is a great way to remember a trip in more than one way. When you’re traveling with kids, keeping them entertained is critical. It can make the difference between a great trip and a miserable one. One way to keep kids entertained while traveling is to let them use personal electronics during down times. Appropriate times to use electronics could be on flights, car rides, in long lines, or while waiting for performances. Whether you use a tablet, a phone, or a video game system, your kids are sure to be amused. Even if your home is typically electronics-free or you limit electronics, traveling is a time when you may want to let those rules slide for the kids. Some planes, trains, and buses have personal entertainment devices built in. Sadly, some others don’t. Having a personal electronic device can keep kids quiet and happy for long periods of time, especially if they are a novelty. If your kids are captivated by electronics, you may get some peace to enjoy on your own. Hot Tip: Before you travel, make sure that you have plenty of apps, movies, or TV shows downloaded and ready to use. You never know when you’ll be without Wi-Fi and it’s almost guaranteed your kids will desperately need a new app or episode when that happens. Small toys and books are great to bring on a trip for your kids. Brand new toys they haven’t seen before, or books that they haven’t read will get even more of their attention. A vacation doesn’t have to be like Christmas with a whole bunch of presents, but a few small items can make all the difference. If you’re on an extended trip, think about buying small souvenirs at each stop. You kids will get new toys and other items that they will love and be excited about for the rest of the trip. You don’t necessarily have to travel with heavy paper books. Load some on electronic devices so if your kids have had enough game or movie time, they can read for a bit instead. Bottom Line: Even as an adult, I always make sure I have a new book or 2 downloaded to read when I go on a trip. Why wouldn’t I make sure my kids have the same thing available to them? As cool as it is to get a new toy when traveling, too much new all at once can be overwhelming for some kids. If you think your child will be a bit anxious about the trip, be sure to bring along something comforting from home to help them relax. A comfort item can be a favorite stuffed animal, small blanket, favorite storybook, or their go-to items at home. Carrying their favorite teddy bear along for the ride might help them get on that plane without worrying about where it’s going to take them or how they’re going to get there. If your child has an item they take everywhere with them when they’re at home, you don’t want to forget to pack it for your trip. Bottom Line: You don’t want to spend your whole vacation answering questions and dealing with complaints about why Tommy the stuffed turtle didn’t come along for the trip. Bring their absolute favorites with you! Kids of all ages usually like to take pictures. Teens like to get artsy shots to share with their friends, and toddlers love to push the shutter button on your phone. Children are more engaged when they’re behind the lens. As soon as your kids are responsible enough, get them a small camera to use on trips. Your kid’s camera doesn’t have to be a fancy DSLR. You can get them a durable point-and-shoot camera, or even let them use the camera on an old phone of yours. If they’re too young for their own camera, you can still let them take pictures with your help using your phone or a bigger camera that you hold while they snap photos. 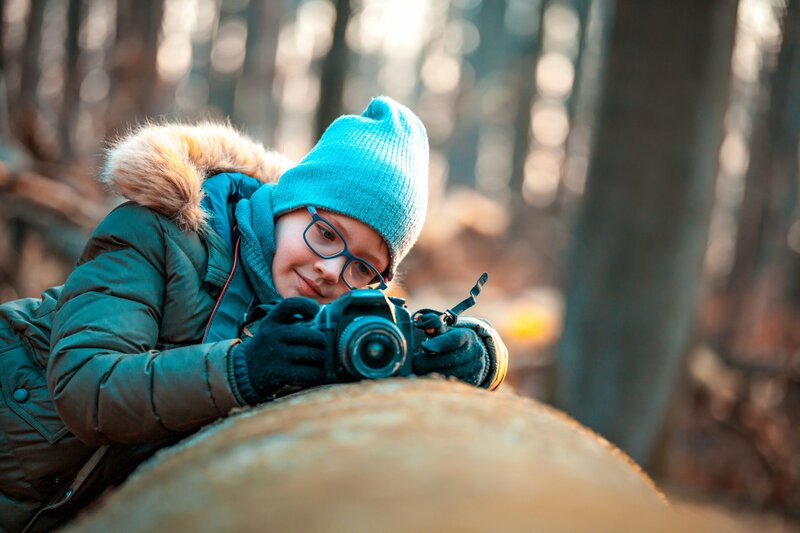 Having a camera and trying to get the best photos will help your child focus more on the things they’re seeing all around them. 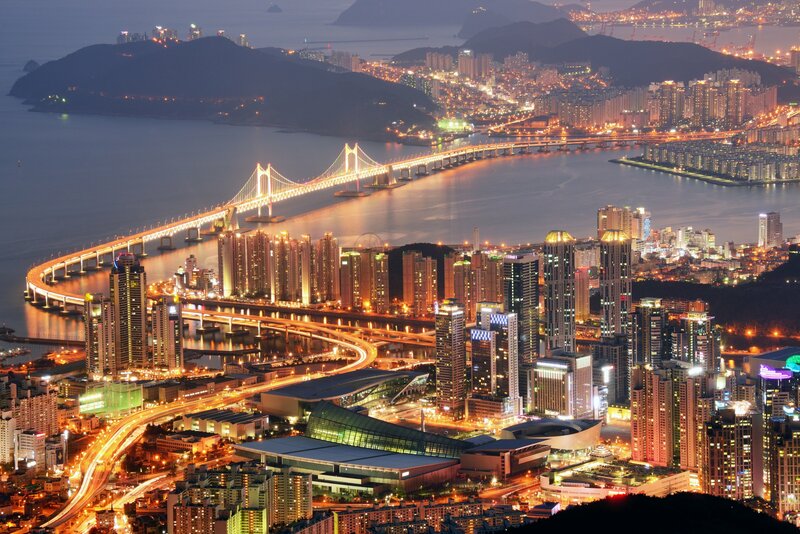 It will help them see the beauty in the landscape, the amazing features in the architecture, and the details of the crowds and bustle of the city. The photos they take will be great for showing friends and relatives when they get back home and for helping them remember the trip for years to come. A great way to get older kids to think more deeply about their trips is to get them a travel journal. Give them a journal and time each night to reflect on the day. Have them write down what they did that day, what they liked, and what they didn’t enjoy along with any general thoughts about the trip or the destination you are visiting. Keeping a journal will help remember the trip in more detail once they return home and will also help them start to get a better idea of what types of things they like to do when traveling. This knowledge can help with planning future trips if there’s a consistent pattern in what your kids enjoy and don’t want to do. The journal itself can be anything. It can be a small notebook or a binder. If your child prefers, it can be electronic, recorded on a phone or laptop that they brought along. 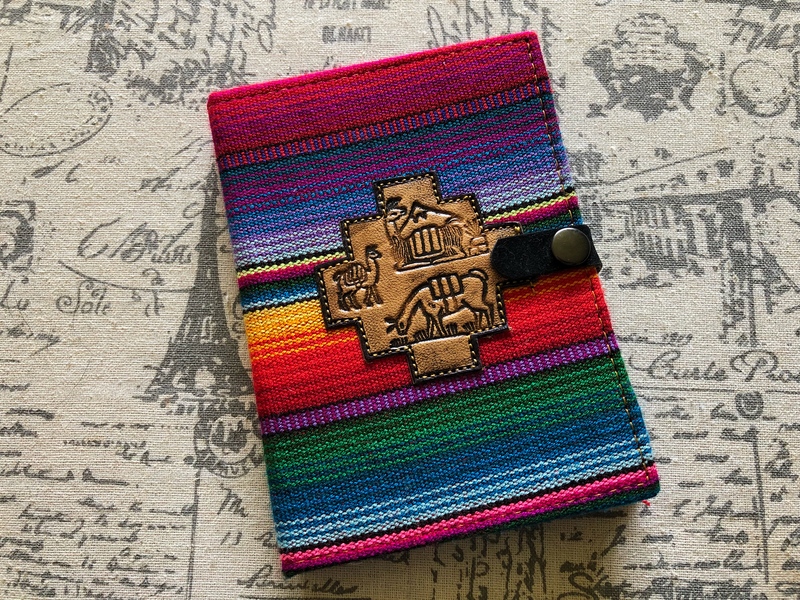 If you can find a cool journal early in your trip, your child can get a neat souvenir and then have a perfect place to record their thoughts about the trip. At the beginning of this section, there’s a picture of the journal that our son bought on our trip to Peru last year. There were so many choices in that market ranging in size, color, and design that he had a hard time picking just one. He made some notes in it during the trip and still uses it as a personal journal today. Every time he picks it up, he can think back to the alpacas and llamas that we saw throughout our trip. When traveling to cities with paved streets and sidewalks, taking a stroller along for the trip is a great idea. In other locations where the surface isn’t as smooth, a sling or backpack might be more appropriate for carting around younger kids. Image courtesy of shutterstock.com. When traveling with babies or toddlers who aren’t potty trained yet, you should always bring far more diapers, pull-ups, and wipes than you ever think you’ll need. 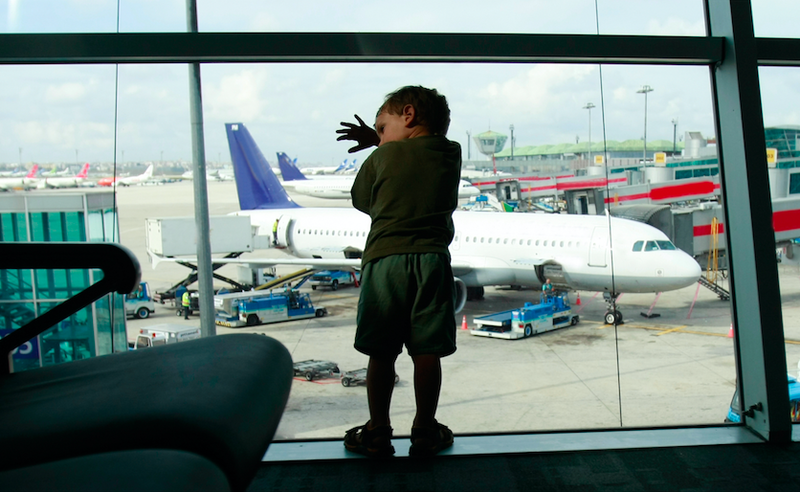 Even on a 1-hour flight or train ride, you might need to change your child 3, 4 times or more. One thing you can be sure of is if you only bring 1 diaper, you will need 2. If you bring 2, you will need 3. We suggest you bring 2 or 3 times more than what you think you will need and a full pack of wipes. It doesn’t hurt to have a few extra diapers at the end of the flight, but it is awful to have too few. The same thing goes for extra outfits. The moment you only bring a few diapers for a short flight is the same moment your baby will have an amazing explosion that will ruin their outfit and possibly yours. Always have an extra outfit for your child and a plastic bag (Ziploc preferably, to contain smells) to put the first outfit in until you can find a place to wash it. When you’re traveling with babies, always make sure you have an extra outfit packed and accessible, not just for your baby, but for yourself. From diaper leaks to spit ups after a feeding, there are plenty of opportunities for a baby to ruin your shirt or pants too. You and your clothes become the backdrop for any extraneous fluids if you’re holding your child. It’s great if you can get your child into a clean diaper and new outfit. But the rest of that flight will be unpleasant for you if you have a soaked pair of pants or a dirty shirt. Bottom Line: Wet and smelly is no way to travel, for you or your child. Babies, and often toddlers, have a hard time equalizing their ears on their own. Popping your ears can be necessary when taking off or landing on a plane, or even when changing elevation quickly on the ground. It’s also required when SCUBA diving, but your babies and toddlers probably aren’t going to be doing much diving on their own. You want to be prepared to help young children equalize their ears. Feeding your baby during these times can help relieve the pressure. The sucking motion will help their ears equalize naturally. Feeding will also distract them from mild discomfort if their ears take a little extra time to equalize. Gum can be a big help as soon as your kids are old enough to chew it without swallowing. The chewing motion can help their ears pop naturally as you change altitude. Hot Tip: Ear pain due to elevation change is one of the main reasons babies cry on planes, so try out a bottle on your next flight and see if you can keep that from happening to your child. The debate between traveling with a stroller or a sling depends on your personal preferences and those of your baby, but here are a couple of guidelines to help you decide what to bring with you on your next trip. Think about the weather. If you are headed to a cold destination, keeping your baby close in a sling may help keep both you and your child warm while you are outside. But if you’re traveling to a warm location, having your baby pressed up against you may lead to a sweaty, uncomfortable mess, so a stroller might be a better option. Consider the ground surfaces at your destination. A weekend tour in an old, historic town might be lovely, but pushing a stroller over cobbled streets will not be. A sling or backpack will be the best option for that type of trip, or one where you’ll do hiking at your destination. 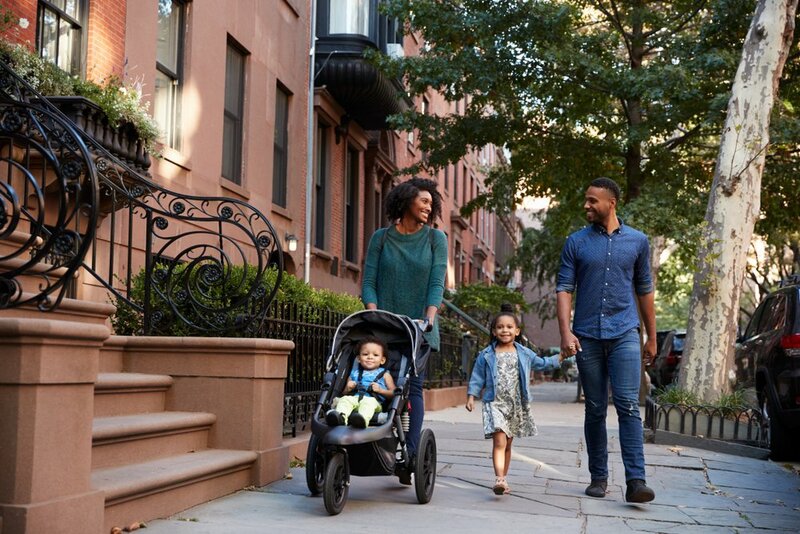 If you plan to stay in a major city where the streets and sidewalks are in good shape, a stroller can be a great way to move your baby around as you explore. There is no correct answer for every type of trip. Take a look at your plans and your destination and pick what you think will work best. Bottom Line: Have the best of both worlds available by bringing a sling and a stroller on your next trip with a little one. Slings can be slipped in with your clothes and add almost no weight, and a travel stroller can fold down and be super light, too. If you take both, you can decide which is better to use on a day-to-day basis depending on your activity and the weather. 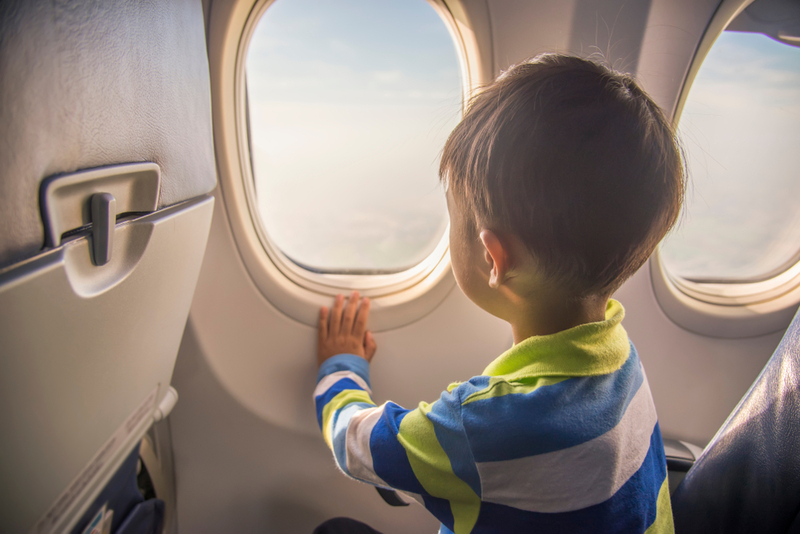 There’s nothing quite like the view out of an airplane window, but you’ll need more than that view to keep your kids happy through the flight. From toys and electronics to making sure you fly at the right time of day, there are lots of things you can do to make sure your flights with your kids go as smoothly as possible. Image courtesy of shutterstock.com. For most destinations, there are several flight times throughout the day. Even if you need to make a connection, you probably still have a couple of options to choose from. The pricing differences on those flights could dictate which flight you choose, but if prices are close, you should look at the flight times and compare them to your kids’ schedules. Your young kids probably have a set bedtime. How do you think it will go if you keep them up 3 hours past that time waiting to board a flight? Probably not too well. On the other hand, if you can get them on the plane for an overnight flight right around their bedtime, they might sleep for the whole flight. When picking flight times, you also want to look at nap times. Do your kids take a nap at the same time each day? Then you should be scheduling your flights so you aren’t either boarding or landing during that nap time. Letting your children sleep when their bodies want to relax will make them cheerier when it’s time to fly and will make it easier for you to get them on and off the plane. Hot Tip: If you can’t pick times that work with your kids’ sleep schedules, either make sure there’s plenty of time to rest before or after your flights or try to adjust their schedules as you get closer to the trip. Changing bedtimes or nap times by an hour or 2 in advance of your trip can make a world of difference when it comes time to fly. When you travel by yourself, you might prefer to schedule the shortest layovers possible. I’ve jogged through the airport to make a connection on multiple occasions while traveling solo. When you’re traveling with children, especially when they are young, you don’t want to cut it that close. 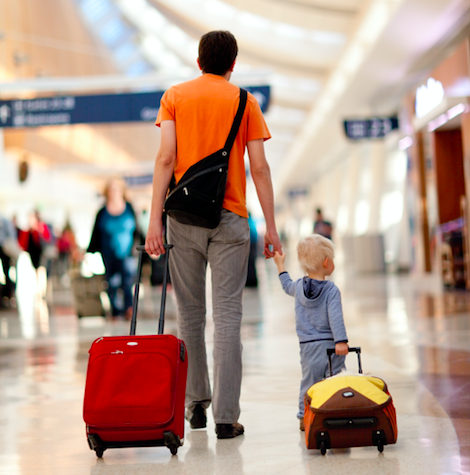 Leaving plenty of time for your layovers means you can take care of everything your family needs and still have enough time to walk to the gate for your next flight casually. If somebody is hungry, you have time to sit down and eat. If the kids need to use the bathroom 3 different times, you have time for that too. Bottom Line: Long layovers mean a little bit more waiting, but they also mean a lot less stress by the time you get on the plane. Nobody is rushing, nothing gets left behind, and everyone in your family is ready to settle in for the ride to your next destination. Nobody likes lines, especially when they are long and slow moving. You don’t want to start off your family trip by waiting in long lines at the airport, so let’s look at what you can do to minimize how long you wait. Long airport lines are typically at check-in/baggage drop, security, boarding, and border control. If you’re flying in a premium class, most of these lines are automatically reduced. Premium passengers get their own line at check-in and baggage drop. Depending on the airport you’re flying out of, you may have an expedited security line as well. 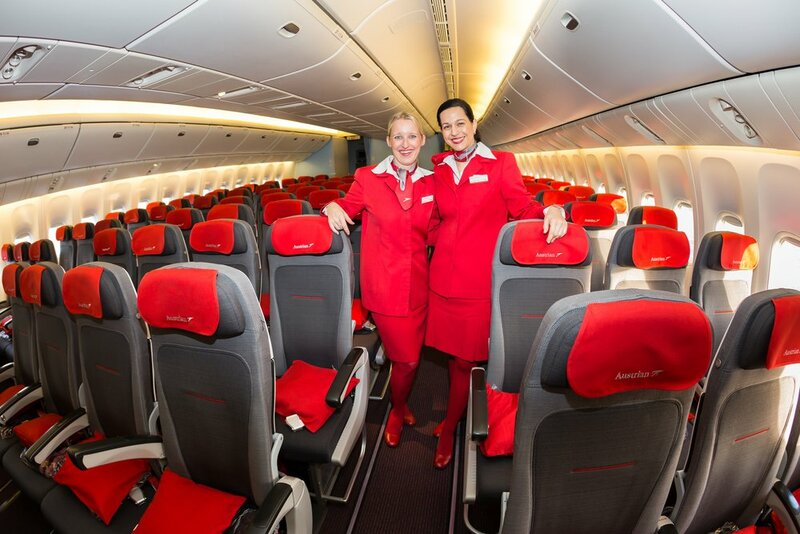 When it comes time to board, you’ll get to board first, giving you plenty of time to get settled and comfortable in your premium seats. Flying premium classes with your family is a great way to use your miles to make sure your travel is more comfortable, and you have a better chance of sleeping on long overnight flights than you would flying economy. If you want to use fewer miles or are buying cash tickets, you will probably be flying economy, so you can’t take advantage of premium passenger lines. Don’t worry; we can help there too. Hot Tip: Even better than reducing the check-in/baggage drop line is skipping it altogether. You can do this by taking care of your check-in online the day before. Travel with only carry-on bags, especially for short trips with older kids. Make sure your whole family is signed up for TSA Pre-Check to speed through security. TSA Pre-Check will give you access to a shorter line where you have an expedited security scan. You won’t need to remove laptops, liquids, shoes, or light jackets. No Pre-Check? At least review our guide to getting through security a bit earier and quicker – it’s got lots of helpful tips! Depending on the airline you’re flying, several credit cards will automatically give you priority boarding. You won’t be the first group to board, but you will still get on the plane before most of the other passengers and have time to get settled. Make sure your family is enrolled in Global Entry for border control when you return to the U.S. You can skip the long lines, use a kiosk, and quickly be on your way home. Hot Tip: Many premium credit cards offer a statement credit for the Global Entry application fee. When approved, Global Entry includes TSA Pre-Check. If you’re a family of 4 and you and your spouse each have 2 of these cards, you can get your whole family signed up for Global Entry and TSA Pre-Check for no out-of-pocket cost. If you’re traveling with a baby or a very young child, they won’t be much help for hauling your family’s bags through the airport. But once your kids are walking well and a little bit older, they should be able to pull a rolling bag or carry a small backpack. As soon as you can get your kids carrying their luggage, travel with your family gets a lot easier. Even if you’re checking bags and need to help with the checked luggage, getting kids to take care of their carry-on bags filled with on-plane activities will lighten your load. Older kids and teens should easily be able to handle all of their luggage whether they have checked bags or not. 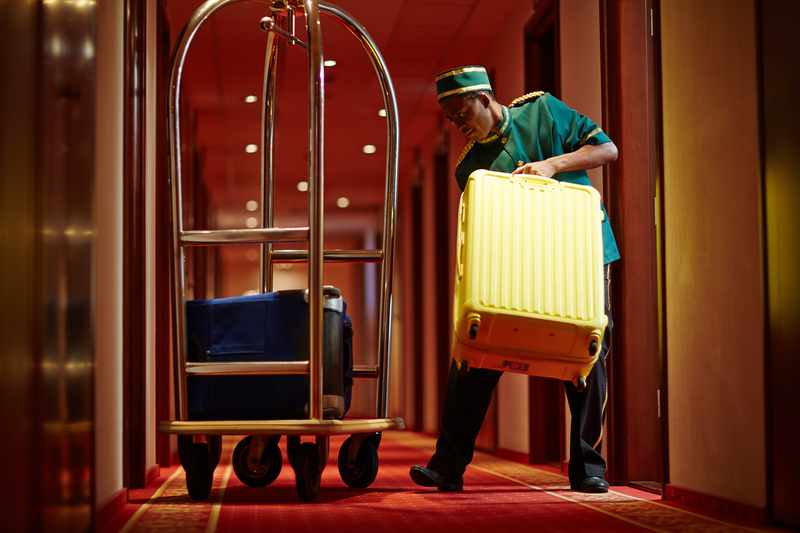 Don’t let your kids get used to you being their luggage service. Get them carrying what they can as soon as possible. Your kids will gain a bit of responsibility for your trip, and your back will thank you. Hot Tip: Unless we are taking something unusually heavy and large like dive equipment or plan to bring home souvenirs like wine or other alcohol, we try to never check bags on our family trips. Our family travels with carry-on backpacks, and we have all been carrying our own for years. Doing this makes it easy to get through the airport, quick to get out at our destination, and keeps everyone in the family from overpacking. Most airlines with entertainment options will provide passengers with cheap headphones to enjoy the content. These headphones are usually free on mainline carriers and typically cost a few dollars on low-cost airlines. It’s incredibly likely that your children will not be happy with the headphones the airline provides. They will be uncomfortable, too loud, too quiet, won’t stay in their ears, or don’t work the way your kids prefer. Finding a pair of headphones that fit your child’s ears and are comfortable for long periods of time is something you should do well before your trip. Whether they’re watching in-flight movies, playing games on their electronics, or listening to music as they try to fall asleep, a comfortable set of headphones that keeps their sound private will make your kids and everyone around them happier. Unless you’re flying in a premium cabin, never rely on the airline to provide headphones that will be comfortable for your kids. You will be disappointed. Even if you’re flying in business or first class and will have use of their noise-canceling headphones, you should probably make sure your kids have headphones they like for times when they’re not on the plane. Bus rides, train rides, or even quiet time at your hotel are great times for your child to listen to music with their headphones. No matter where in the world you travel, you are bound to find some great activities that the whole family will love. 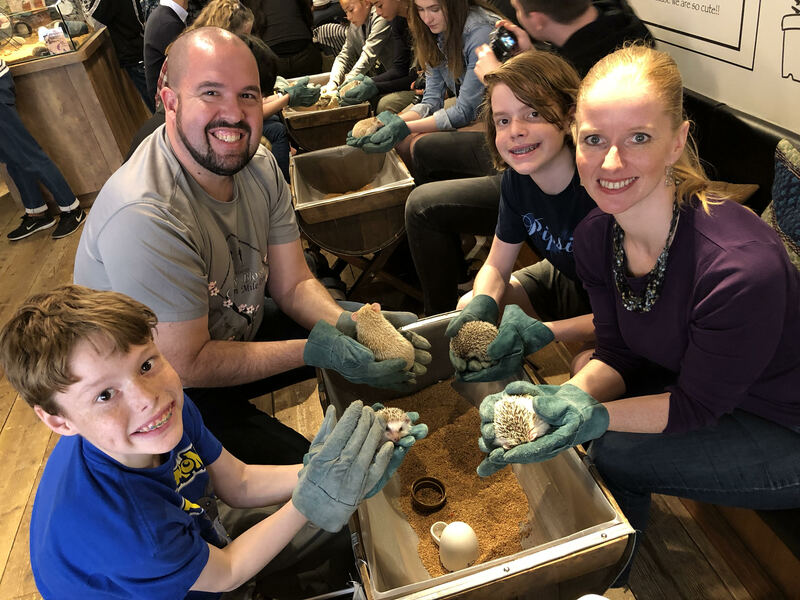 On our recent trip to Tokyo, we stopped by for a visit at the Hedgehog Cafe and spent the better part of an hour playing with and feeding these adorable little hedgehogs. The amount of downtime you need will vary significantly depending on the age of your kids. Infants and young toddlers probably need daily naps. Older kids may be able to power through a long day, but likely won’t be able to do that for several days in a row. If your days are packed with activities when you go on vacation, even the adults could probably use a siesta by the second or third day. Scheduling downtime every day of your trip helps keep your family refreshed and ready to explore, and it keeps everyone happier throughout the trip. As you travel with your kids, you will quickly get an idea of what they need for downtime each day. Our advice is to make sure they get it. If you need to push through and miss a rest one day, that won’t be too bad, but if you skip your downtime every day, you will find yourself paying for it by the end of your trip. The kids will be tired and cranky, and nobody will be having a good time. Public transit is fun for kids, but it amuses me too. My wife picks on me because when we travel to a new city, I always want to try all of the forms of public transit possible. Trains, subways, buses, trams, monorails, funiculars, tuk-tuks, ride shares, public bikes, etc. Every type of public transit provides a whole new type of travel. As amusing as this is for me, it will be great for your kids too, especially when trying out a new type of transportation that they haven’t been on before. Every new form of transit will give them a whole new view of the city. From what they see out of the windows to the people they see riding along with them, your kids will be able to experience the town just like the locals do. Bottom Line: Using public transit in major cities is often quicker and cheaper than taking taxis or private cars from place to place. You save some money and a bit of time, and your kids get to experience something new. 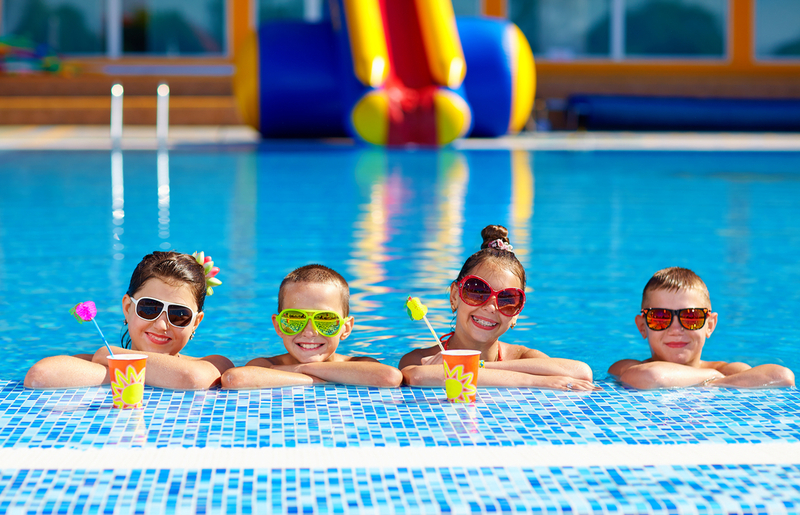 As your kids get older, they will probably want to have more of a say in what you do when you are on vacation. Let them! Remember, this trip isn’t just for you. This trip is for your kids, too, and if there are things they’re interested in, you should make an extra effort to include them in your plans. Your children might not want to do a whole bunch of research about your destination, but if you give them some choices of places to see, they will often be happy to pick. We use this technique to choose all sorts of activities. We usually give our kids a list of 5 or 6 possibilities and tell them a bit about each one. Then they each get to pick a couple of the things they would most like to do. The kids’ choices and our choices usually combine for a great trip during which everyone in the family gets a little bit of what’s perfect for them. Your children will be more invested in the trip and more excited about what you’re doing if they have a say in choosing the places you see. It’s a great way to get them involved in planning starting at an early age. Our son really enjoyed learning about ancient Rome when he was in sixth grade. So much so that he asked if we could go to Italy for spring break. We didn’t have a trip planned yet and there were award seats available, so we let him pick more than just a few activities. He got to choose the location for the trip! The look on his face as he was explaining to us where the speeches took place in the Forum and as he asked if we could go stand were Cicero stood was just priceless. We were able to take what he had learned in school to the next level by showing him the places where it actually took place. I don’t think he’ll be forgetting that trip or those history lessons anytime soon. There is a tendency among those of us who maximize loyalty programs to stay at different hotels each night of a trip. There are many reasons for switching just as hotel brand promotions for rewards after a certain number of stays, limited award availability, or exploring the different hotels a city has to offer. When you’re traveling with your family, do your best not to switch your lodging any more than you have to. If you’re going to a different part of the city or a different location altogether, obviously, you will have to change where you’re staying. However, if you’re staying in the same general area for your whole trip, you will be much happier if you stay at the same place for the entire time. There’s a whole lot more to pack and unpack every time you move with kids. Kids are good at spreading their stuff around a hotel room, and you don’t want to be gathering everything up every day. You don’t want to have to bring your family back to the hotel every day to switch to a different place. Your time with your family is much better spent exploring your destination. Finally, there is a certain level of comfort that your kids will develop with each place they stay. The longer they are there, the easier it will be to relax, fall asleep, or be content lounging in their favorite spot. We’ll finish up this list of tips with another one of the most important things we can tell you. When you reach your destination, no matter how much you have planned for your time there, always remember to be flexible! Things will go wrong, people will get cranky and need a rest, places will be closed, and everything will take more time than you expected. If you spend your trip stressed out about making it to the next thing on your list, that stress will work its way into every member of the family. Instead, relax. Be flexible in your schedule. Keeping your family happy is the most essential part of any trip. You will see a lot of your destination while you are there, but there is no way you can see everything. Pushing everyone to rush to see one more thing isn’t going to make the trip any better. Getting upset because you missed something isn’t going to help either. Bottom Line: Be flexible, go with the flow, and have a great trip with your family. The biggest tip we can give for traveling with kids is to stop putting it off and get out there and travel. Everything might not go according to plan, but your family will love seeing the world, and you’ll be planning your next trip before you know it. Nothing opens children’s minds like new experiences, and you’ll get plenty of new experiences no matter where you travel. From food to transportation, architecture, and landscape, everything you do will be exciting and new for your little ones. Be sure to use some of our tips from above to make your trip easier and more fun for everyone, and keep an eye out for more of our family travel pieces. Soon, we’ll get into the details of specific places to go, things to do, and some of the best travel products for you and your family. There’s lots more to come. Since discovering miles and points in 2010, Jeff has traveled to over 35 countries, flying in first class, business class, and sometimes even in coach. Whether he’s staying in a hostel dorm, or in a luxury suite at a 5 star hotel, Jeff is constantly looking for the best deal to make travel as close to free as possible.